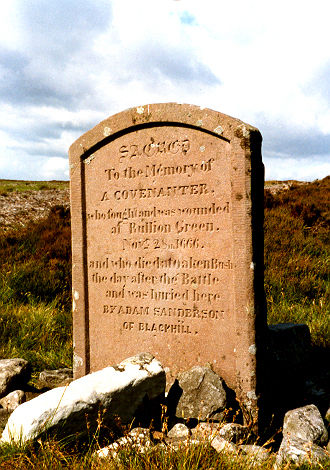 The Unknown Covenanter was found dead at Black Law farm after he had escaped from the Battle of Rullion Green. He had requested that he be buried in sight of his beloved Ayrshire, which is just visible form here. The grave of the unknown Covenanter is found on the slope sof Black Law hill, north of Dunsyre. The gravestone was erected in 1841. An older stone marked the site. This older stone is now located within Dolphinton (Black Mount) Parish Church.